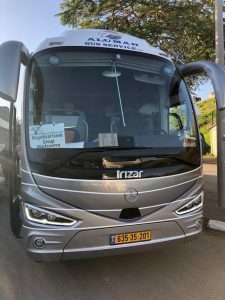 Our Brand NEW 2019 Irizar Mercedes Bus in Israel! Wow! What a modern technological and elegant beauty! Beats the camels of olden days. Nothing but the best for our pilgrims! Previous post: Gotta Love Grandkids – especially blowing a raspberry!